I’ve been in a writing rut lately. Other than the work I’ve been doing on this blog and at mybattlewithra.com, I’ve pretty much hit a writing dry spell. I haven’t written a creative piece in months. So even though I’ll be living off of Ramen and PB&J for the next two weeks, I took a week off from my job for a mini vacation. While Lancaster, PA is the farthest thing from my ideal tropical oasis, I thought a week in cow country would do me some good. I tried keeping to a writing routine, despite the fact that I was considering my retreat a vacation. Every day after my fiance left for work I took my computer outdoors. I particularly enjoyed sitting on the wooden picnic bench on the porch, and the occasional trek through the garden also proved beneficial. The change of pace and the minimum amounts of concrete helped quell some of the career-induced anxiety that has been plaguing me for some time. Still, I found myself unable to write much. I was relaxed but uninspired. A grave in Laurel Hill. Photo my own. My fiance was off on the last Saturday of my vacation, so we decided to spend some time in Philadelphia before I went home to Jersey. We had been talking about a Philly outing for months now and I was ready to tackle the activity list I’ve been sitting on. First stop: Laurel Hill Cemetery. 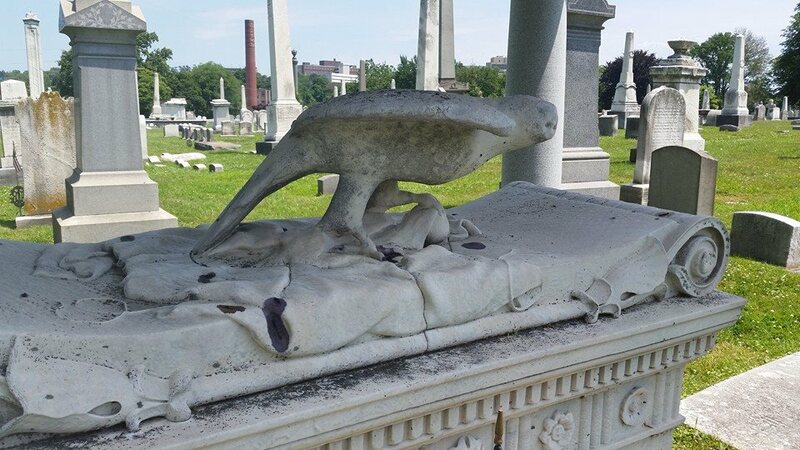 I’ve posted about my love of cemeteries numerous times throughout this blog. Anyone who cares to know me knows that cemeteries are a normal part of my life. This one in particular piqued my interested because of its size (78 acres!) and age.There’s no place more peaceful or romantic. Maybe it’s just my imagination, but the minute I stepped out of the car I felt stories and poetic lines bubbling up. Maybe ghosts were whispering stuff to me, a la Neil Gaiman’s The Graveyard Book. Ya never know. The one melancholy thought I had (because I generally don’t find cemeteries depressing) while walking through Laurel Hill hand-in-hand with Francis is that most of the stories floating around me will never be told again. They died with their owners, and I could only hope to imagine what some of them might be. That might be the only aspect of death that scares me: I worry I’ll die before I can get at least one out into the world. I just don’t like the idea of being nothing more than a name on granite. 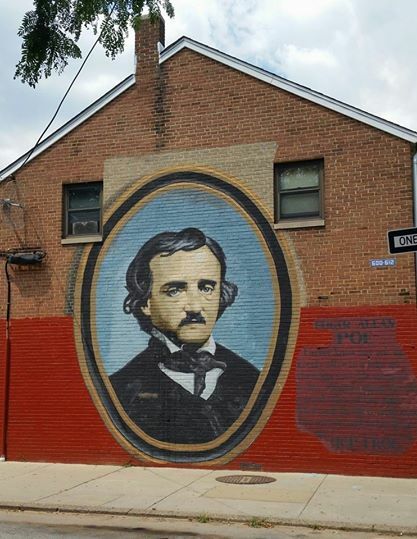 Artwork near the Poe house. Photo my own. probably the best followup activity. The house itself is depressing. The outside is beautiful, but its interior has been stripped down to the plaster. There’s no furniture or signs of ever being inhabited thanks to a lack of funding. Still, I can die happy knowing that I walked the same hallways that my favorite person in history walked. As the tour guide told our group about Poe’s numerous failed literary journals and the literary criticisms he wrote to feed himself, I realized that this was all kind of inspiring. I’ve always secretly wished I could be Poe. Hell, I might have been happy being Mrs. Poe, alcohol addiction-problems aside. Here was a normal person who struggled all his life to produce the work he loved doing, and people are still visiting his dilapidated house postmortem. Can that be me? I’m not naive enough to think that I can just decide to be a famous writer without doing any of the work. I’m aware that I picked a tough business to break into. But my week away has given me new hope and fresh ideas. I started submitting new pieces to magazines and editing the few that still aren’t completely ready for other eyes. I’m out of my funk, but now I have a new problem in that I’ve contracted writer-induced insomnia. I’ll take it though. Now excuse me while I go catch up on the Camp NaNoWriMo word count I’ve been slacking on.